I enjoy making porch pots. It’s exciting when a passion and opportunity come together. The Dunnville Horticultural Society (DHS) was scouting a writer for their monthly column. Since I enjoy gardening and writing, I knew this was a match for me. Every person is passionate about something. Nature is one of my passions. Nature’s beauty has surrounded me at every stage in life. At an early age, we took walks along the picturesque Niagara escarpment where we lived. Growing up in a family of gardeners instilled a love for gardening. My dad was given his own garden plot at age 4. At age 83, he still grows amazing vegetables and fruit. My mom makes delicious preserves. I enjoy creating “porch pots” for all seasons. Just as nature has its seasons, so too life has its seasons —some tranquil, some more turbulant. Most of my adult life was lived in Waterloo where I studied, worked, and, as a single mom, raised two sons. In 2010, I was blessed to remarry (a nature soul-mate) and move back to Niagara. Our new family grew to embrace 4 children and spouses, 8 grandchildren, a dog, and 3 grand-dogs. Gratitude, awe and serenity describe the gift of nature at this stage in my life. Author John Muir says, “Everybody needs beauty as well as bread, places to play in and pray in, where nature may heal and cheer and give strength to the body and soul.” This is my experience with nature. Our gardening passion is also nurtured as members of DHS. Every monthly program brings new learnings and friendships. You don’t need to be a member to attend. On Feb. 18 Theresa Forte (garden columnist, photographer, & award winner) will be speaking. 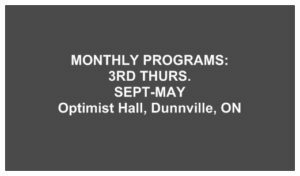 “If You Plant It They Will Come: Bees, Butterflies, Birds.” 7-9pm, Optimist Hall, 101 Main St. W., Dunnville. Hope to see you then. Sandi Marr, DHS Recording Secretary. With heavy hearts we wish to announce the peaceful passing of Maura Cooper. Our February Program evening was opened by Debbie Thomas at 7:04 pm. Members and guests were warmly welcomed on a cold, wintery night. 54 people signed in. 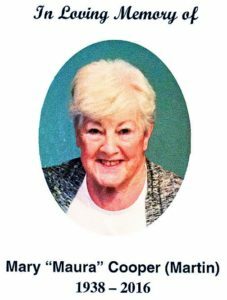 The passing of longtime DHS member, Maura Cooper was recognized. She coordinated our kitchen and refreshments with great commitment. Debbie read a message from her family expressing thanks to DHS for being a huge part of Maura’s life. Tonight’s meeting was dedicated to Maura. Maura will be greatly missed. As promised, our business portion will be kept to a minimum at our Monthly Program nights. 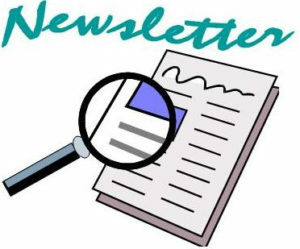 Newsletters and bulletins will be sent out via email. Our website is also filled with information. For those without internet, Betty B. will continue to call. The Treasurers Report and Program Minutes will be posted on our Bulletin Board. Agendas also contain Newsletter information on the back. Quint Night was held Feb 17th. Dunnville’s Service Clubs presented their work. DHS was invited for the 3rd time. DHS was well represented with Debbie T., Deb Z., Gloria H., Marilyn S., Wray M., Rob and Sandi M. attending. Debbie spoke on our behalf about the work of DHS. Tonight’s trivia question: why is the evening called “Quint?” Don Z. answered correctly: “5 Service Clubs” and he won a gift certificate to AW. Sign up sheets were circulated for upcoming events. 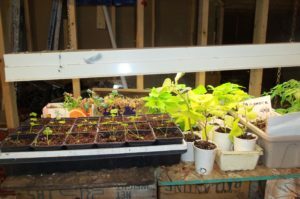 Each event was highlighted and members were invited to volunteer as they have interest: garden tours, Lions Home and Garden show, plant sale, planting day, annual bed clean up, decorating town pots for Christmas, and weeding. Youth from Dunnville Secondary School are invited to obtain Community Service Hours by volunteering with DHS. One Bursary may be awarded to a qualifying DSS student (one of the criteria is 10 hours volunteering with DHS, along with pursuit of Horticultural studies). Kim C. is updating our membership lists. Please pass along your information to Kim specifically what year you became a member. The photo and description of “Witches Broom” was shared with thanks to Marlene L. This is located at Grandview Lodge by Maple Grove entrance for those who wish to view it out in person. Feel free to let us know about unusual items in the future that are of interest to members. Everyone was invited to share their ideas in the “Suggestion book” located by the Ways & Means table. Snack volunteers were invited for Sept. and October and asked to record their names in our “Refreshment book.” Bev M. will be stepping in to help with the kitchen in Maura’s absense. Thanks to Bev M. and all who provide refreshments. Tonight’s snack was graciously provided by Petra Kruis Daley, Clara Draaistra, Doreen Love, and Marilyn Stavinga. District 9 is hosting a bus trip to Canada Blooms on March 16. We are welcome to join. See Debbie for details (cost, time, etc.) if you are interested. Bus leaves from St. Catharines. Breaktime was announced. Early bird memberships were available. Our program resumed at 7:40pm. Our guest speaker was introduced: Theresa Forte (writer, photographer, and speaker) from Niagara Falls. Topic: “If You Plant It, They Will Come: Bees, Butterflies, Birds.” She spoke about naturalizing our gardens to attract bees, butterflies and birds. Her photography skills were evident along with her passion for gardening. She generously donated one of her matted photographs which was won by Peter Z. At 8:45 pm our evening concluded with our Early Bird Draw. A $25 gift certificate was provided by Hauser’s Pharmacy. Ways & Means raised $57 and winners were announced. Beverage donations were $34. Everyone was dismissed with wishes for safe travels until we gather again. Gardeners make creative grow tables. When the temperatures drop and the cold winds blow, some of us like to escape to sunny destinations. Others choose a different journey. Gardeners sow seeds to escape the frigid February chill. 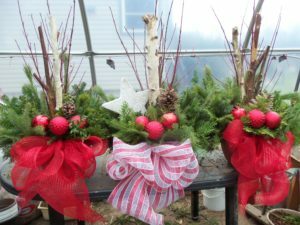 With vegetable or flower seed packets, fresh growing medium and recycled plant containers, we transcend the winter blahs. Whether we are novice or experienced gardeners, February is the time to start seeds. Those of us who sow our own seeds, do so for good reason. First of all is the sheer pleasure. We take delight in the miraculous—tiny seeds emmerge from soil. Second, cost. Growing our own seedlings is cheaper than buying seedlings at a nursery, garden centre or big box store. Third, timing. Plants aren’t always readily available at garden centres when we want to plant them. Fourth, quality. Pests and disease can be controlled when we grow our own. Fifth, community building. Gardeners are generous souls. We plant more than we need so we have plenty to share with others. Prepare for starting seeds indoors by gathering supplies and equipment. The most crucial element for successful seed starting begins with quality and fresh seed. Each year as seed ages, it’s germination diminishes as well as the quality of the young plant. Using sterile soil, supplemental light, and bottom heat of about 70 degrees F are the other crucial elements. Keep careful records such as name of the plant, planting date, days until germination, and maturity. Be sure to read the fine print in seed catalogues pertaining to culture and growing conditions such as soaking certain seeds before planting. Recycled McDonald’s coffee cups, Dairy Queen sundae containers or Sobey’s chicken containers serve well for planting seeds. Covering your seeds with a plastic wrap prevents them from drying out. Starting seeds doesn’t need to be costly, just fun and creative. Wondering what to do in February? Sow some seeds for spring plantings. Spring WILL be here before we know it! Please join us on February 18, 7-9pm, at the Dunnville Horticultural Society Monthly Program, Optimist Hall. Speaker: Theresa Forte (Author, Photographer, Canada Blooms Speaker), “If You Plant It, They Will Come: Bees, Butterflies, Birds.” Monthly programs are open to non-members as well as members. Come for warm friendship, nourishing snacks, and fun recycled garden give-aways. Call Debbie Thomas, President (905) 774-3064 or Deb Zynomirski, Vice President (905) 774-8453. Witches Broom - Found on the grounds of Grandview Lodge. The Dunnville Horticultural Society held their early bird membership draw, with the winner receiving a twenty five dollar gift certificate donated from Hausers Pharmacy. Guest speaker for the night was Theresa Forte a past Canada Blooms speaker. Her talk ” If you plant it they will come” along with a beautiful slide show of plant choices from her own gardens that entice, protect and feed Bees, Butterflies and Birds. Marlene Link, a DHS member, shared pictures with the group of a unique phenomena that occurs in nature, when a mutation on a tree or shrub forms in very specific way, and often only a keen observer like Marlene may notice it and know exactly what it really is. Some may assume it to be a squirrel or bird nest, or just a bundle of twigs. In medieval times, mysterious and unexplained occurrences were often blamed on witchcraft, and brooms during this time were made of bundled twigs. Hence the name “witches broom” has stuck ever since. In horticulture its now understood that a number of stresses, both biological and environmental can lead to the formation of witches broom. Organisms such as fungi, mites, and aphids can cause abnormal growth when they attack a tree host. Environmental stresses that injure the growing points of the branches can also trigger the formation of shoots with short internodes that resemble a bundle of twigs. Some may look like a ball shaped dwarf plant, growing in the tree. Its believed that many of our dwarf varieties today originated from this type of mutation. 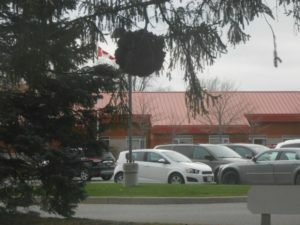 The picture Marlene provided was taken at Grandview Lodge in Dunnville, and can be viewed from Maple Grove Place. DHS members are a friendly group always eager to share their gardening knowledge, tips, passion and even blunders. Next program is on Thursday March 17 with Guest Speaker Adam Koziol owner/grower from Earthgen. His topic is “Native Tree Planting With Fast Results.”As always All Are Welcome, membership not required. Doors open at 6:30pm and the program begins at 7pm. The DHS meets at the Dunnville Optimist Club, located on the corner of Main and Cedar St. For information contact DHS President Debbie Thomas at (905) 774-3064.